Carl G. Lange: First proponent of the “low” vs.”high” road? From Lange (1885). The “low road” goes from the eye to CO’ to CV — all subcortically. The “high road” goes up via cortex before coming down to CV. The pathway from the eye to CO’ leads to CV rather directly. 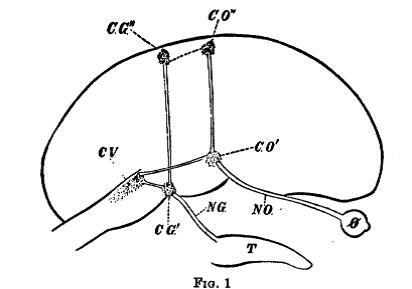 CV is a motor stage somewhere unspecified but in the brainstem. This applies to “simple” cases. But when a “mental process” is involved, cortical stages of vision and taste must be engaged, namely CO” and CG”. Now, the “impulses” get to CV from cortex! I didn’t know about this passage, which I found rather stunning! Do you know of earlier formulations of this type of dual-route model? If so, let me know!